Typepad won't load my picture, but I've put up big news today on the future of the news but it is on flickr. Go there for the in-depth. You might think the big media news is the start-up announcement of Fox Nation, but it isn't. It is the announcement by Arianna Huffington that investigative news will be privately funded by a non-profit and the the first subject to be tackled will be The Economy. it will bankroll a group of investigative journalists, directing them at first to look at stories about the nation's economy. The popular Web site is collaborating with The Atlantic Philanthropies and other donors to launch the Huffington Post Investigative Fund with an initial budget of $1.75 million. That should be enough for 10 staff journalists who will primarily coordinate stories with freelancers, said Arianna Huffington, co-founder and editor-in-chief of The Huffington Post. ...Work that the journalists produce will be available for any publication or Web site to use at the same time it is posted on The Huffington Post, she said. The Huffington Post venture is reminiscent of ProPublica, a nonprofit independent newsroom funded by The Sandler Foundation and headed by Paul Steiger, former managing editor of The Wall Street Journal. ProPublica works with a $10 million budget. Another way the news is shifting: Slate launched "Shoot the Recession," a project in which readers have been asked to help document the economic crisis in photographs via submitting images to the group page Slate set up on the photo-sharing site Flickr. I've added some of my shots. As part of my ongoing media study on the Financial Crisis, I looked at four front pages to see how the graphics and headlines played the story of the Stimulus Compromise on February 7th (at 9:00 am). Because I see this as being the big story of the week, with anticipation continuing until the bill passes, I wanted to compare and contrast both the graphics and the headlines from four media as they presented the story (links to front page screenshots are on Flickr): the NYTimes, WaPo, HuffPo and Drudge. This is an interesting study in old and new media. The best graphic to tell the story, in my opinion, belongs to HuffPo, which is the top graphic depicted at right. For this graphic, HuffPo uses the symbols of the two parties placed facing opposite directions, with the democrat donkey looming huge as compared to the GOP's elephant. The graphic fits the headline and in reading left-to-right, placing the most important story element in the left position, as most people read, the donkey comes first as the lead character in the story. Compare that to the graphic that Drudge used, of a tornado and lightening looming large and white in a dark night (illustration at bottom). The idea of this iteration of fear captures the crisis of what, for many, is seen as an uncontrollable potential catastrophic event (this week Obama used the term catastrophe in speaking about what might happen to the economy if the bill does not pass). One hot big issue generating buzz is artist Shepard Fairey's use of an AP photo as the base to remake the photo for his famous Obama poster. I write a lot about the postmodern trend of iterations -- remakes and reuse and remixes of culture artifacts. Fairey's attorney says that it is a fair use appropriation. AP says Fairey stole the photo and violated copyrights. Stay tuned. Fairey's attorney, Anthony Falzone, is the executive director of the Fair Use Project at Stanford University and a lecturer at the Stanford Law School, one of the places where copyright has been explored (Lawrence Lessig's work on creative commons copyright was initiated while he was at Stanford). Appropriation in the digital world has gone out the roof, but appropriation and the ownership of creative works is as old as time. Perhaps the Obama Poster is the most famous example of art appropriation. Kottke notes: Fairey's use of the picture are well within the parameters of "fair use". His transformative use of the image - both in flipping and re-orienting it, adding jacket and tie and the "O" Obama logo, and converting it to his block print style make it consistent with all legal precedents for use. Richard Prince is an appropriation artist, as is Andy Warhol and Roy Lichtenstein. Warhol used iconic images and remade them. In 2009 Prince once again has been sued for appropriating the work of another artist - In 2005 Prince used a photo of a Marlboro Man and it was auctioned for over $1.2 million. A copyright lawyer notes that this area of "appropriating and manipulating images has become a widespread phenomenon. His appropriation may foreshadow the copyright battles of the future, and a weakening of the visual artist's copyright." At issue is who owns art and who profits from the ownership? Stay tuned. More to come. The first photo of the airplane crash last week, Miracle on the Hudson, was taken by a passenger on a ferry with a cell phone and uploaded to the web via Twitter. I am continuing to follow my undergrad field of journalism as it evolves into e-journalism. In 2008 online news overtook tangible printed media and stories everywhere predict the death of the newspapers. Some, myself included, believe we are entering a golden era of journalism. When I left NYC in mid-2007, I was embarking on completing my last grad course for my master's in Media Studies as Renzo Piano's building for the New York Times was preparing to open. Under the radar, the NYTimes online news was preparing for a revolution in reporting news. My friend in NYC periodically updates me with what is happening there and this week told me of her tour of the NYTimes building. When she told me she noticed that the creative journalists in the online area use Macs while the print area journalists are on PCs, I wasn't surprised. Last fall stories predicting the death of newspapers, the NYTimes in particular, were everywhere. The best story detailing how online innovation is exploding using the NYTimes as an examample is New York Magazine's story last week, The New Journalism: Goosing the Gray Lady, which is about how renegade cybergeeks saving the NYTimes. Back around the turn of (this) century, fires in the Sangre de Cristo mountains in New Mexico (where I live now) were best covered with online news submitted by citizens who could report on site what was happening. The Santa Fe New Mexican provided online links to the news, providing real-time coverage of a serious threat to the area. This was the canary-in-the-mine for me, alerting me that the shift was starting. Eight years later, as the financial crisis hit, blogs are mainstream and other information sites like wikipedia allow linking. For an example of how this is changing us and changing how online news is telling the stories, read: 1) Frank Rich in the NYTimes A president Forgotten but Not Gone and note how he links out to broaden his story about how Bush is smaller than life and how vast the wreckage is; 2) NYTimes op-ed by Nicholas Kristoff, If This Isn’t Slavery, What Is? to see how the NYTimes is allowing new tech/media tools like LinkedIn, Facebook and Digg to expand readership; and 3) this story in Esquire by Tim Heffernan on how the Bush administration events on a timeline link up with tech innovations like blogs, youtube, wikipedia, etc. I did a study for a new media class on how Bush couldn't manipulate the news coverage of Katrina because blogs gave voice to the real story. I should publish it online -- had I not moved from NYC I would have expanded this as a thesis. (note: I have to scoot off to an event but will come back and post links in the above paragraph). Update: links added to last paragraph. Aristotle taught us that spoken words are our symbols of mental experience and words are the symbols of spoken words. We became textually fluent and entered a time of revolution after moveable type made text widely available. But now, we're entering a post-literate time and digital literacy is replacing textual literacy. I'm perplexed, trying to understand this, especially as a bibliophile spending hours this fall unpacking and sorting beloved books from storage. Most adults didn't read one book last year. Americans watch almost six movies a month on DVD. Those ages 18 -24 watch 88 DVDs each year. The average person saw 6.0 movies in the theater in 2007. And this: Even those who are supposedly literate retreat in huge numbers into this image-based existence. A third of high school graduates, along with 42 percent of college graduates, never read a book after they finish school. Eighty percent of the families in the United States last year did not buy a book. Our words and language are becoming abbreviated, mere blips and talking points and tag lines, ideas packaged by politicians and pundits and sold like products. We've seen the botched puffery of Palin's words and Bushisms that contorted our language (Palin “joined this team that is a team of mavericks” and the W. Bush classic, “Is our children learning?”). But in the world of Twitter and little lines of friendship via IM and facebook, we're changing. George Orwell wrote on the Politics of Language but that was in a different time, at the rise of mass communication that made packaged word terms possible and constructed messages for mass audiences powerful. Look at the logos, at right, that are recognizable today without words and hold meaning as stand-alone signs. Meaning and ideas are moving away from text and I would contend also away from face-to-face transmission. Terry Heaton writes that we're in a post-media world. Maybe for now. I think we're headed for a post-literate world. Today you can pull in President Elect Barack Obama's chat via YouTube (think Fireside Chat). Recorded as the weekly Democrat radio address yesterday, once it airs today on radio, it will be available on Obama's transition site, change.gov. He's coming straight to you. Whenever you want to pay attention to him and pull in his message. Are you empowered to get his communications directly? "The Obama team has written the playbook on how to use YouTube for political campaigns. Not only have they achieved impressive mass -- uploading over 1800 videos that have been viewed over 110 million times total -- but they've also used video to cultivate a sense of community amongst supporters," said Steve Grove, head of news and politics at YouTube. This is perfect communications for our post-literate society, the leader going straight to you. The graphic, left, used for Rock the Vote, hearkens to creation stories of the Hopi, Zuni and other Native Americans whose myths speak of emergence from an inner world. I've written about the Obama logo and how the symbol, like the Nike brand, needs no words. The symbols are as much a part of the message as text, if not more. But there is something more. Obama is redefining the sense of belonging to a community, or at least he has tapped into the bowling alone isolation of our culture. Getting unfiltered communications, even if only one-way, upsets our media system of spokespeople and pundits. Obama went straight to Facebook, straight to Twitter, straight to people who want to belong, want to be part of something, want to interact directly as part of a community. Lonlieness isn't healthy and facebook friends are not deep affiliations. Bowling alone is lonely, you know. The Secret Service calls Obama Renegade (his wife is Renaissance, and their daughters Rosebud and Radiance). W. Bush was called Trailblazer. How we get our information in order to be informed citizens so we can uphold our democracy will be interesting. Obama is on the cutting edge, coming directly to you. But it is more than that. There is a cultural and sociological need to be part of something beyond oneself. Obama is an avenue of connection. Big stories are media tornadoes, shaking up audiences as the news outlets hustle to get the story out and capture viewers. Hurricane Katrina launched Anderson Cooper to his own news segment. The latest, breaking must-know version pulls us in as we need to know. Fox News gained audience share when it blew past CNN on the 9/11 coverage. The Great Financial Crisis is the perfect storm that will push new media to flesh out its online potential. Alan Greenspan calls it a "once in a lifetime credit tsunami" -- a far cry from his idea of irrational exuberance of yesteryear. The story flew to the front pages in mid-September and October was a scary month. ComScore reports: Only 26% of consumers believe the economy will be better a year from now; 82% are more fearful about the economic future than ever before. The Dow is down 28% year-to-date; 83% of voters listed the economy as the major issue. After an up day election day, the Dow had its worst two-day fall in history this week. Big Media is coming apart at the seams (see Part I) and Media Daily News writes that "there is no historical precedent, given the powerful unraveling of the global economy" and the big lumbering media giants are going to bite the dust. Pew Research Center for People and the Press reports that the internet has overtaken newspapers as the main source where people look for campaign news. The Global Financial News Crisis is the Black Swan creating the perfect storm for change that is going to create a watershed event for news, I believe. The online news sites already launched into heavenly orbits with the political campaign cycle, creating heavy hitters like The Huffington Post and Politico, up 472% and 344%, respectfully, from a year ago. But unlike politics which is keyed into the 24/7 news cycle, the Global Financial Crisis is harder to understand and is the perfect story throwing out up-to-the-minute breaking news that sway markets, globally. A flap of a butterfly wing in Madrid can cause a drop in the Dow a financial writer notes. Will educated older readers have incentive to shift to online reading through this story? Deeper links and timeliness are what pulls people in and the online media can provide the latest, breaking news in depth (for those readers educated enough to want to seek out the news). Some have said that this Global Financial News Crisis is the death knell to the evening news. According to an August report from the Pew Research Center for the People and the Press, the percentage of those who say they had read a newspaper on a given day has dropped from 50% in 1998 to 34% in 2008. At the same time, those who have gone to the Web for news at least three days per week jumped from 13% to 37%. I think this is the year the numbers blast off. Media Shift reports that economic bloggers are gaining clout with this crisis (for the same reason that audiences are tiring of traditional journalism) because they "tend to go beyond the he-said-she-said level of reporting on the economy, while a reporter simply quotes a few experts with opposing views." And, as the specialty bloggers have gained credibility, journalists have started tapping into their expertise. Sites like CNN with its CNN Money page and HuffingtonPost with its new-last-month Big News Page for the Financial Crisis, pull in readers that want specialized news. Reading James Surowiecki (author of The Wisdom of Crowds), in November 3rd's New Yorker, which is now fully online for subscribers, has the link availabl to non-subscribers, is old news by the time I get it in print. Like more online sites aiming for deeper news coverage, the New Yorker writer explains hedge funds and writes that the madness of crowds wasn’t the whole story--"...It’s hard enough to catch a falling knife." American Journalism Review notes that the future of the newspaper will be the elite newspaper -- offering "analysis, interpretation and investigative reporting" to "the educated, opinion-leading, news-junkie core of the audience" who "will insist on it as a defense against 'persuasive communication,' the euphemism for advertising, public relations and spin that exploits the confusion of information overload." Indications are that Americans will keep retrenching, ending the longest economic expansion on record and the economy is the major story of the moment. I'm cutting out the non-essential magazines. Oh, wait. I've already done that, except the New Yorker and Atlantic Monthly and a few others I like to curl up with. I no longer have papers delivered to my doorstep. There will be winners and losers over the coverage of this story, now named The Global Financial Crisis and the economic event itself has created a perfect storm for drastic changes in the mediasphere. Knowing this would be a big day, $$$$$-wise, I've watched how the media is covering this huge story. With a passion for media studies, I had to bite this subject for a study. I've put up a comparison of screen shots of the 5:00 p.m. news cycle for online major news sites on my Flickr site. What made me want to pay attention to this was that while I was tuning into C-Span to see how the House brought this to debate and a vote this morning, I checked the headlines on Digg and was astonished that heavy online users were not paying attention to this story. Two stories, "Chef dies after making ultra-hot sauce for chili-eating" and "Collection of Unusual Clock Designs" made me wonder how our population was paying attention. Sure enough, Digg had the first story on the chef still leading the page on the top stories. Hello???? Anyway, that sparked my study. I'd started noting that this was historic in the No Good, Terrible Horrible, No Good, Very Bad Week and I started studying the graphics of this story then, posting the cover art in my ramble, How Now (Brown) Economy. How is the media playing this? Neil Cavuto, who my husband says "the things he brings up ahead of time are important things to look at, he's made good calls, he doesn't scream and get crazy, he looks at all sides and he's a very smart man," said this today on Fox cable: I don't know what people will do. My mother ate onion sandwiches for lunch during the depression. Well, let's eat onion sandwiches and look at this as it unfolds, media-wise and graphic-wise. 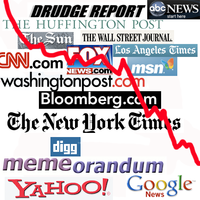 Here's my artistic take with captured media presentations of the issue: US Economic Crisis Media Study.